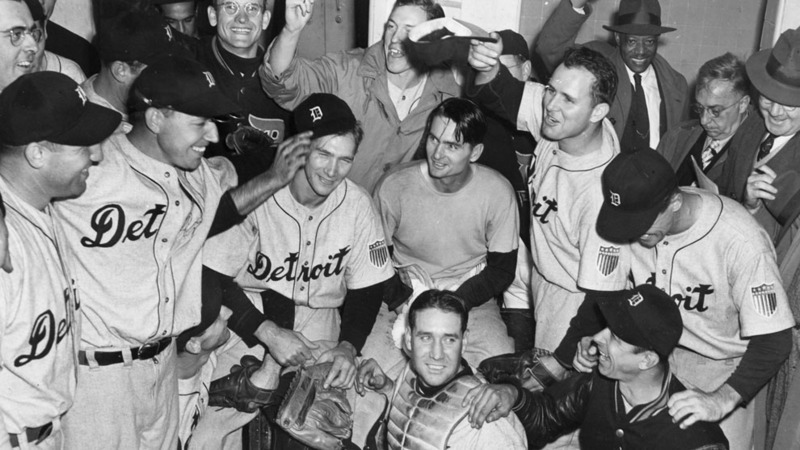 The 1945 World Series is remembered as the last war-time Fall Classic, and thus as one devoid of stars, but both the Tigers and Cubs featured some fine players. Future Hall of Famers Hank Greenberg and Hal Newhouser led Detroit, while the Cubs enjoyed the services of Phil Cavaretta, Stan Hack and Andy Pafko. The Series opened in Detroit, but the Tigers could do nothing with Cubs starter Hank Borowy, who won 10 games for the Yankees during the season, then 11 more after being traded to the Cubs. Borowy tossed a six-hit shutout, rolling to an easy 9-0 victory. Detroit got on the board in Game 2, winning 4-1, thanks to Greenberg's three-run homer and nine strong innings from starter Virgil Trucks (who'd been discharged from the U.S. Navy less than a week earlier). Though the war was over, wartime travel restrictions were still in effect, so the teams stayed in Motown for Game 3. Chicago's Claude Passeau was brilliant, allowing just one hit -- Rudy York's second-inning single -- in topping the Tigers, 3-1. After a short trip to Chicago, Tigers starter Dizzy Trout evened the Series with a 4-1 victory in Game 4, limiting the Cubs to five hits and one unearned run. Game 5 was a rematch of the opener, but this time Tigers ace Newhouser bested Borowy, 8-4, as Greenberg smashed three doubles and scored three times. The Cubs led Game 6 late, 7-3, but the Tigers tied things with four in the eighth, and the contest moved to extra innings. Finally, in the bottom of the 12th Stan Hack -- already 2-for-4 with two RBIs -- dropped a two-out double into left field, and pinch-runner Bill Schuster scored the winning run from first base, thus forcing a decisive Game 7. Borowy had earned the victory in Game 6 with four innings of scoreless relief, but after a day off, Cubs manager Charlie Grimm elected to start his ace in Game 7. Unfortunately, Borowy allowed singles to the first three batters he faced, was lifted, and the Tigers wound up scoring five runs in the first inning. That was all Hal Newhouser needed, as he went the distance to pick up the Series-clinching 9-3 decision.